Beautiful Kelly's Run on a chilly spring day! Southeastern Pennsylvania has a lot to offer when it comes to moderately challenging day hikes. After ten years of exploring, I thought I'd found all of the best options. Aside from favorites like Hawk Mountain, the Pinnacle/Pulpit, Sunfish Pond, Mount Minsi, and others I've done multiple times, there are still a handful I haven't done yet, but know I want to. Kelly's Run didn't make the list because until this weekend, I didn't know it existed. And if not for the Lancaster County Conservancy, there's a chance I and others might not have had the chance to visit it at all. Both Kelly's Run and the Pinnacle Overlook are part of the same preserve. It sits 30 minutes south of Lancaster, 45 minutes east of York, and an hour and 45 minutes west of Philadelphia. Google Maps searches for Kelly's Run Nature Preserve will get you to where we parked to start our hike, here. We hiked counter-clockwise, but in hindsight, I'd go clockwise to get some of the relatively uninteresting parts out of the way first. Click here for a park map. 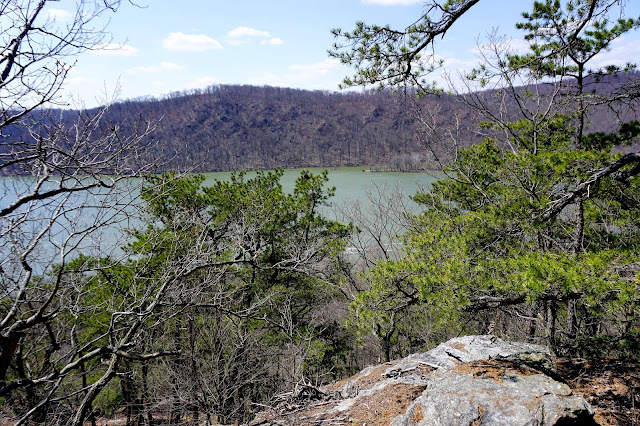 Though many who visit the area head straight to the Pinnacle Overlook, we took the scenic route over the course of 5.5 miles around as much of the preserve as we could. We walked north from the parking area in search of the red/orange blazed Conestoga Trail, and that quickly led us to the blue blazed Kelly's Run Trail. The Kelly's Run Trail took us through stands of rhododendron and bare trees I've no doubt are lush and green in the summer months. One of a handful of Kelly's Run crossings. The strategically placed rocks made all the difference! After about 0.6 miles on the Kelly's Run Trail, we came to my favorite section of the day's hike. 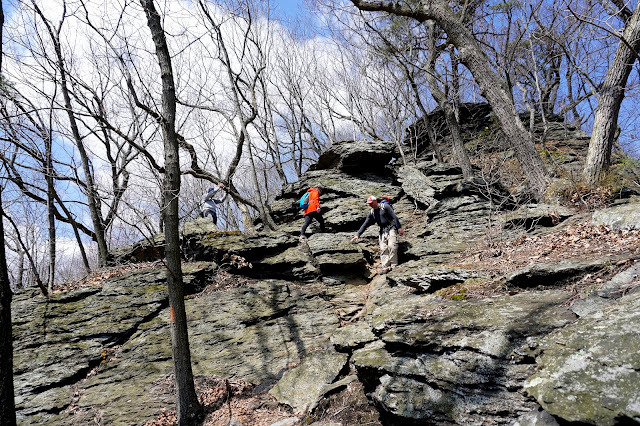 The trail is steep, rocky, slippery, muddy, and required careful attention to footing. 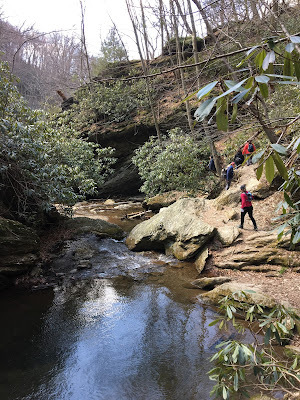 But walking along the edge of Kelly's Run, carefully navigating steep gorge walls adjacent to beautiful cascading waterfalls made for a pretty incredible walk in the woods. We followed the Kelly's Run Trail another 0.5 miles to a junction with the orange blazed Conestoga Trail. 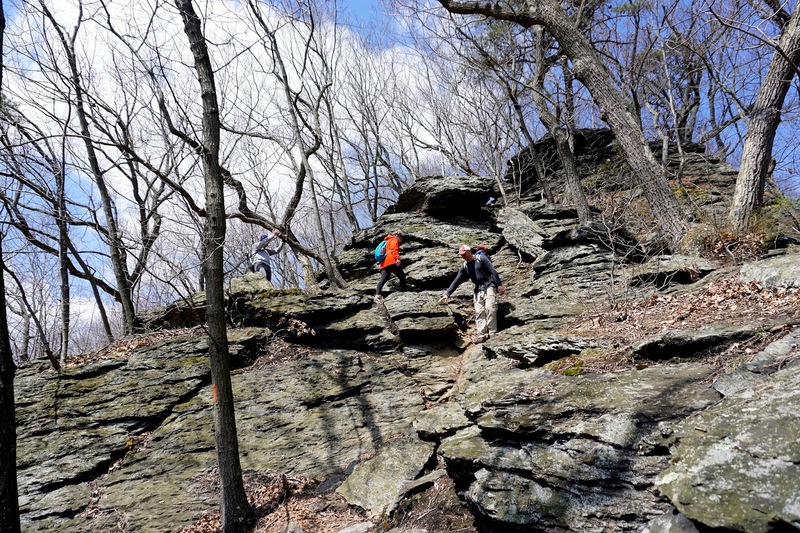 Setting our sights on the Pinnacle Overlook, we climbed up steep, rocky terrain, skirting the edge of the Pinnacle Overlook Nature Preserve and taking in views of the Susquehanna River below. The climb up to the Pinnacle Overlook from Kelly's Run doesn't look like this the whole way, but this part was a challenge! The 700' climb was worth it, as climbs to scenic spots usually are, but the wind hit us in full force when we arrived at the overlook after just over 0.5 miles. We didn't stay long, opting for the red blazed Pinnacle Trail to descend after taking in the view. Stopping to take in the view of the Susquehanna River near the Pinnacle Overlook. The Pinnacle Trail dropped us on to the Conestoga Trail briefly before reconnecting with the blue blazed Kelly's Run Trail. An old bridge crossing Kelly's Run came into view, but the decking was completely gone, making it risky to use to cross and continue on. Most of our group rock-hopped to cross Kelly's Run, but using the railroad culvert is an option as well. Mother Nature's starting to reclaim the land around the bridge, it's pretty neat to see! From there, we turned on to a maintenance road and followed it uphill. 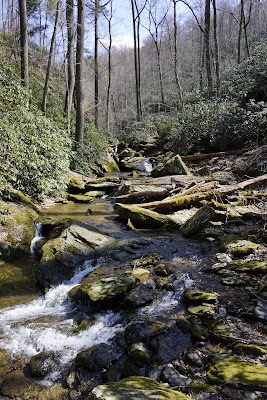 I missed the sound of the water flowing downhill and the soft ground, but we were back in the woods soon enough. The Kelly's Run trail wound us around woods, through fields, and across power line cuts back to our cars, completing the 5.5 mile round trip in around three hours. I loved these steep canyon walls! 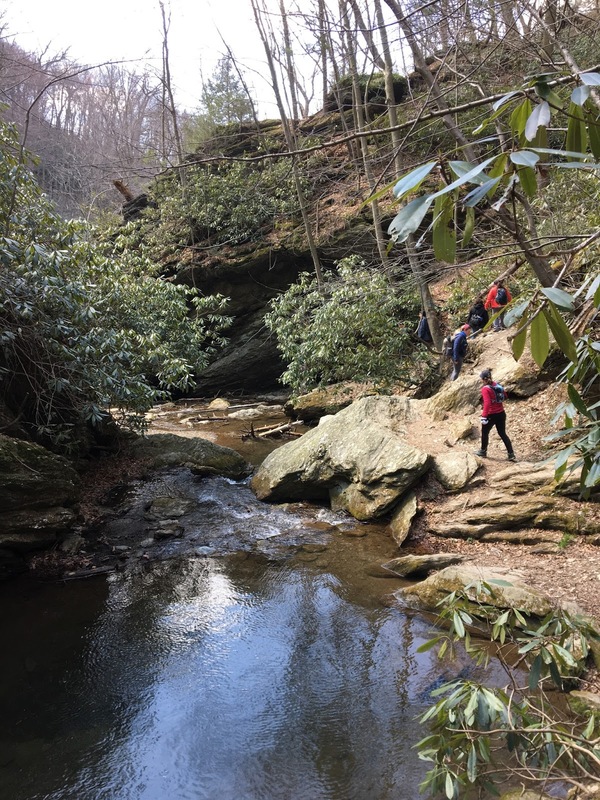 If you're looking for a lovely moderate day hike within a short drive of Philadelphia, this is a great option. Though we did see other hikers, the trail wasn't super crowd despite it being a beautiful sunny day. There are multiple crossings of Kelly's Run along the route. 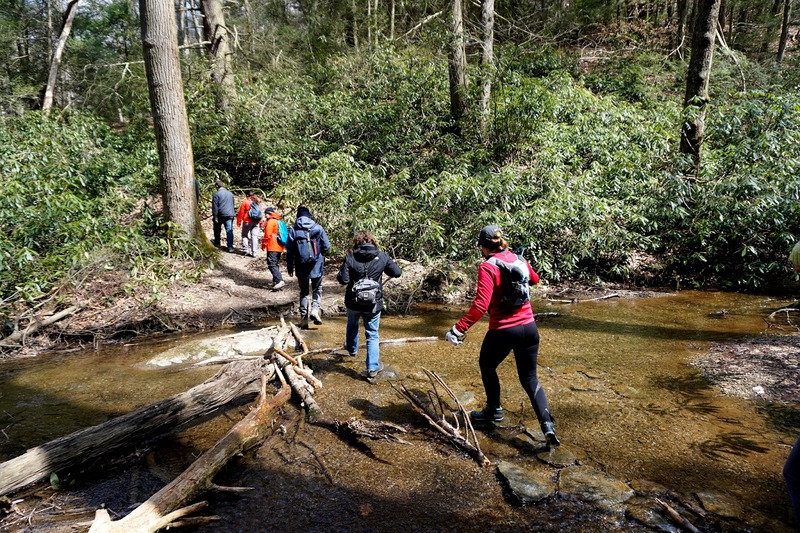 Wear waterproof shoes and consider bringing hiking poles. Blazes are often sporadic and faded, and some are on the ground. Keep your eyes peeled! We found portable toilets in the parking lot when we started our hike, and up at the Pinnacle Overlook. Not up for the hike to the Pinnacle Overlook? You can drive there, parking along Pinnacle Road when gates are open. 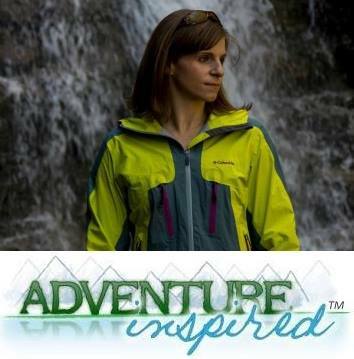 Learning more about the places we hike is always a good idea! 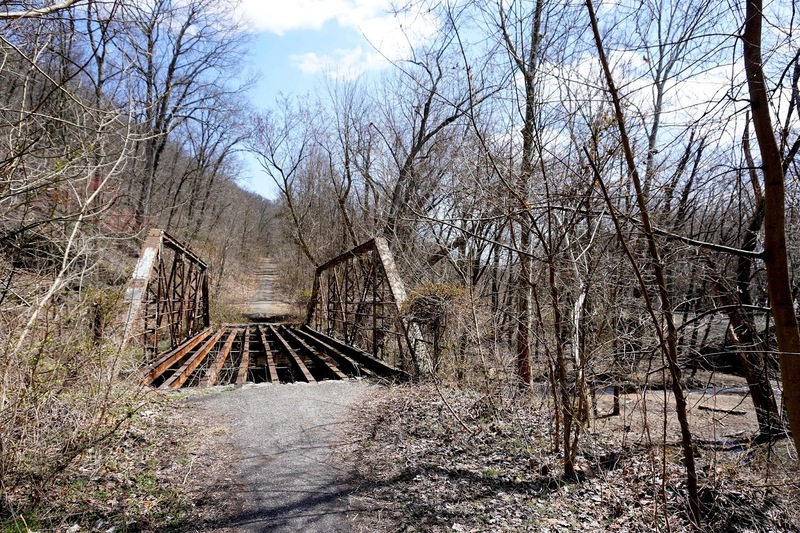 In April 2016, Holtwood Recreation Area was closed to the public without warning. but a verbal agreement was reached between Talen Energy and the Lancaster County Conservancy to open the area back up in July 2016. Have you been to Kelly's Run and/or the Pinnacle Overlook? Do you have stories of places close to home you didn't know existed, and found them by chance? Sound off in the comments!